The roll is terrific. Perhaps the best sub/steak roll I've had...and I've had many. As I went back to the counter to ask what kind of roll I was eating, I got, "...kid, we make our own rolls!" Bravo to that. Whatever they're doing is working b/c the inside soaked up the juicy goodness of the steak and onions while the outside is just crispy and hard enough to give a nice texture barrier. 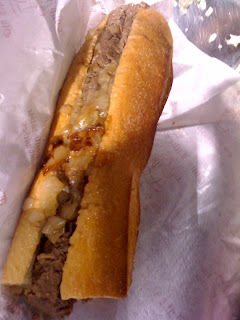 - 5 ...after the fact, I've been told by a few sources that Tony Luke's uses Liscio rolls for their roast pork. It's unconfirmed if these are the same rolls used for the cheesesteaks.